Members of the Crane family and McAllen officials announce plans for this year's marathon Wednesday in McAllen. McALLEN — The McAllen Marathon, which last year attracted 1,800 competitors, will be run Jan. 21, launching from the Convention Center at 7 a.m. Registration must be submitted before 5 p.m. Jan. 12. The full marathon registration costs $110; the half costs $90. There are also categories for a five-person relay — costing $70; a 10K, $30; and a 5k, $25. 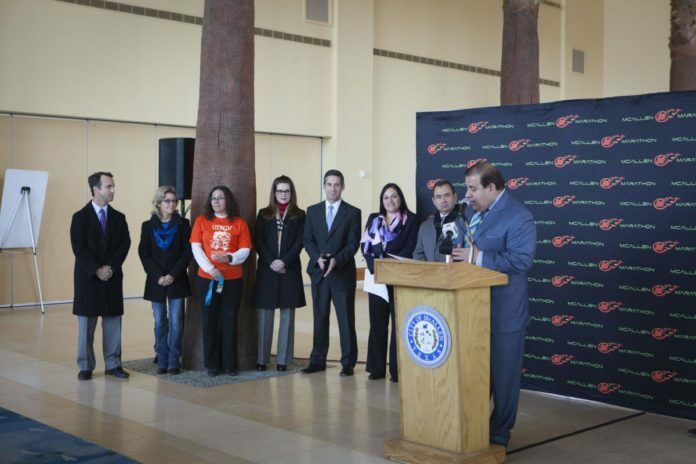 The 10K and 5K races will take place on Jan. 20, as well as the final mile of the McAllen Kids Marathon. The McAllen Marathon is a USATF-certified course and is a qualifier for the Boston Marathon. There will be restrooms, water and first aid available throughout the race route. There will also be entertainment at a couple of stops on the course. The marathon is named after late McAllen City Commissioner Scott Crane, who died unexpectedly in 2014 after dropping out of the second annual McAllen Marathon. The marathon has since renamed the event the Scott Crane Memorial Run in his honor. The races will go on regardless of the weather.